Corru-Kraft takes pride in conducting business with an environmental awareness and is committed to promoting sustainable development across all locations. As part of Orora, Corru-Kraft’s focus on sustainability is not just a specific set of actions, but an operating philosophy. 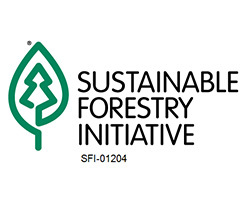 Corru-Kraft is certified to meet Sustainable Forestry Initiative (SFI) fiber sourcing requirements. To earn SFI fiber sourcing certification, there must be an auditable procurement process in place to ensure all fiber comes from responsible and legal sources. The SFI certified sourcing certification demonstrates Corru-Kraft support for improved forestry practices and strong communities across North America. . If you purchase board from CK and would like to print the SFI logo on your product you must also be certified by SFI. See http://www.sfiprogram.org/getting-certified/ for more information. In addition to being SFI certified, Corru-Kraft carries both virgin and recycled liner.